Born June 27th, 1989 in Dijon (France). 2012 16th of the World Superbike Championship with 4 Top10: 7th in Australia (R2), 10th in Spain (R1), 9th in Czech Republic (R1), 5th in Britain (R2) and 4th in France (R1). 2011 16th of the World Superbike Championship with 5 Top10 : 10th in St.Marin (R1), 8th in Britain (R1), 10th in Germany (R2), 7th in Portugal (R1) and 10th in Portugal (R2). 2010 2nd of the European Superstock 1000 Championship with 2 pole positions, 7 podiums and 1 win. 2009 3rd of the European Superstock 1000 with 2 pole positions, 6 podiums and 3 wins. 2008 2nd of the European Superstock 1000 with 1 pole position, 5 podiums and 3 wins. 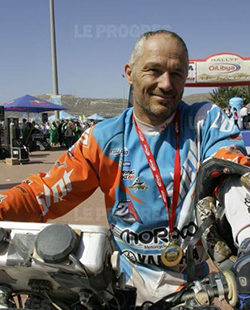 2002 3rd of the Bol d’Or. Participation in the world Supersport championship (2 races). 2001 18th of the world Superbike championship. 2000 Winner of the Italian Superbike championship. 1999 6th of the Australian GP of the world Superbike championship. 1998 8th of the world Supersport championship. 1997 11th of the world Supersport championship. 1996 Winner of the Italian 750 Sport Production championship. Winner of the Italian 750 Suzuki Cup. Yamaha test rider in WSBK. Circuit Carole record holder in 59’4. 2001 Participation in the French Supersport Championship. 2000 Participation in the French Supersport Championship. 1999 4th of the Le Mans 24 hours. Participation in the French Supersport Championship. 1998 Participation in the Bol d’Or 24 hours. Winner of the French Supersport Championship. 1997 Participation in the World Endurance Championship. 5th of the Le Mans 24 hours. Participation in the French Supersport Championship. 3rd of the French 600cc Championship. 1996 Winner of the French Promosport 250cc Championship. 1995 Winner of the Spa 24 hours category Stocksport. 2nd of the European Endurance Championship. Participation in the French Promosport 250cc Championship. 1994 Participation in the French Promosport 250cc Championship. 2005 – GMT 94 Winner of the Endurance Master. Winner of the Le Mans 24 hours. 2nd of the Bol d’Or 24 hours. 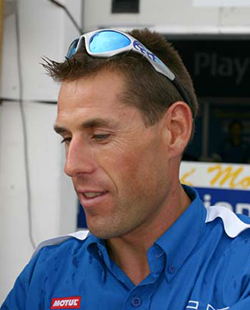 2004 – GMT 94 World Endurance Champion. Pole position at the Le Mans 24 hours. Winner of the Oschersleben 24 hours (Germany). Winner of the Zhuhaï 6 hours (China). 2nd of the Albacete 12 hours (Spain). 2nd of the 500km of Assen (Holland). 3rd of the Suzuka 8 hours (Japan). 2nd of the 200 miles of Vallelunga (Italy). 2nd of the Le Mans 24 hours. 2003 – GMT 94 2nd of the Brno 6 hours. 3rd of the Bol d’Or 24 hours. 3rd of the World Endurance Championship. 2002 – GMT 94 4th of the Le Mans 24 hours. Pole position at the 200 miles of Silverstone. 3rd of the 200 miles of Silverstone. Winner of the Brno 6 hours. Pole position at the Oschersleben 24 hours. 3rd of the Bol d’Or 24 hours. 2001 3rd of the French Supersport Championship. 2nd of the Bol d’Or 24 hours. 2000 Winner of the Le Mans 24 hours. 3rd of the Bol d’Or 24 hours. 1999 2nd of the Spa 24 hours. 2nd of the Bol d’Or 24 hours. 1998 Winner of the Spa 24 hours. 3rd of the Bol d’Or 24 hours. 1997 2nd of the World Endurance Championship. Winner of the Bol d’Or 24 hours. 3rd of the Le Mans 24 hours. 3rd of the Spa 24 hours. 1996 2nd of the French 600 Supersport Championship. 2nd of the 6 hours of Assen. 1994 2nd of the French Open 250cc Championship. 1993 2nd of the French Open 250cc Championship. 1991 Winning French 125cc Championship. 2nd of the French Open 125cc Championship. 1999 – GMT 94 Participation in the Bol d’Or 24 hours. 1997 4th of the Bol d’Or 24 hours. 1996 Winner of the Spa 24 hours. Winner of the Assen 16 hours. 1995 3rd of the Bol d’Or 24 hours. 1994 Official rider in European 250cc Championship. 1993 3rd in the Bol d’Or 24 hours. 1991 4th of the Spa 24 hours. 2002 – GMT 94 Participation in the Oschersleben 24 hours. Winner of the French Stocksport championship. 2nd of the Spa 24 hours. 2001 Participation in the French Supersport championship with 1 win (Lédenon). 2000 5th of the French 250 Open championship (Team of France of speed). 1999 5th of the French 250 Open championship (Team of France of speed). 1998 Winner of the Aprilia 125 Cup. Start in competition. 2001 – GMT 94 Replacing rider for the Le Mans 24 hours. Replacing rider for the Spa 24 hours. Replacing rider for the Oschersleben 24 hours. Winner of the world endurance cup. Participation in the Stocksport championship with 2 wins (Le Mans and Magny-Cours). 1999 Official rider 600 Supersport and Endurance. 2nd of the Le Mans 24 hours. 1998 Official rider Suzuki 600 Supersport and Endurance. Winner at Magny-Cours in 600 Supersport. 5th of the Le Mans 24 hours. 2nd of the Bol d’Or. 1997 3rd of the Open 600 Supersport championship. 5th of the Le Mans 24 hours. 1996 2nd of the Open 600 Supersport championship. 5th of the Le Mans 24 hours. 1995 – 1994 Winner of the European Endurance Stocksport championship. 1993 8th of the Kawasaki Cup. 1992 Winner of the French Cyclo G2 championship. 2004 : 4th BMW Cup in Donington, UK2003 : Winner of 24 hours of SPA moto (Belgium) Winner of Bol d’Or Winner of Masters Endurance.2002 : Winner of the 24 Hours of Le Mans Winner of BOL d’OR 2nd of MASTERS Endurance moto.2001 – GMT 94 : 2nd of the World Endurance Cup. Winner of the Le Mans 24 hours. Pole position in the Brno 6 hours. Winner of the Nürbürgring 6 hours. 2nd of the Liège 24 hours. Pole position in the Oschersleben 24 hours. 2000 – GMT 94 : Winner of the Oschersleben 24 hours. 4th of the Le Mans 24 hours. 2nd of the Estoril 6 hours. 2nd of the World Endurance Cup.1999 : Pole position in the Le Mans 24 hours. Participation in the Spa 24 hours. Podium in Estoril. Replacing rider.1998 : 6th of the Bol d’Or 24 hours. 3rd of the French Open 250cc Championship in Carole. 1997 : 6th of the Bol d’Or 24 hours. 3rd of the French 125cc Championship. 4th of the XJR Yamaha 1200 Cup. 1994 : Participation in the World GP 125cc Championship. 1993 : Start in competition (Tech 3). 3rd of the French 125cc Championship. 4th of the European 125cc Championship. 1991 : Winner of the French 50cc Championship. 1992 Participation in the World Superbike Championship. Participation in the Le Mans 24 hours with GMT 94. 1991 10th of the European Superbike Championship. 10th of the Bol d’Or 24 hours. 1990 First podium in European Superbike Championship (Suede). 7th of the Bol d’Or 24 hours. 1989 2 wins in the French Superbike Championship. Participation in the Le Mans 24 hours. 1988 3rd of the French National Production Championship. Participation in the Le Mans 24 hours. 1987 4th of the French National 250cc Championship. Born August 2nd, 1984 (France). 2003: Winner of the Oschersleben 24 hours. 3rd of the Bol d’Or 24 hours. 3rd of the World Endurance championship. 2002 : World Superbike championship. 2001 : 3rd of the Italian Superbike championship. 1997 : Winner of the Italian Superbike championship.1996 : 6th of the World Cup Superbike.1994 : First private rider of the world Superbike championship.1993 : Winner of the Italian Sport-production championship.1992 : 3rd of the European 125cc championship. 1989 : Winner of the Italien GP 125cc Trophy.1987 : 2nd of the Italian GP 250cc.1986 : Winner of the « Cronoscalata » championship.1985 : Winner of the Sportproduction 125cc championship. 2007 2nd of the French Superbike Championship. Winner of the Bol d’Or 24 hours. 4th of the Le Mans 24 hours. 2006 2nd of the French Open Stocksport Championship. Winner of the Le Mans 24 hours. 5th of the Bol d’Or 24 hours. 2005 Win in Superproduction (Magny-Cours). 2nd of the French Open Stocksport Championship. 3rd of the Le Mans 24 hours. 3rd of the Bol d’Or 24 hours. 2004 Winner of the Albacete 12 hours. Winner of the Assen 500km. 2nd of the Bol d’Or 24 hours. 2003 Winner of the Open Stocksport Championship. 2002 Winner of the World Endurance Championship. Participation in the French Stocksport Championship (2 podiums in 2 races). 2001 3rd of the Bol d’Or 24 hours category Superproduction. 2000 3rd of the European Superstock Championship. 1999 First podium in the French Promosport 600 Cup (Pau). 1997 Start in competition (CB 500 Cup). Born August 22nd, 1974 Participation in 24H of Le Mans track (with GMT 94). 2009 Winner of the French Superbike Championship. 2007 Winner of the Bol d’Or 24 hours. 2006 3rd of the Le Mans 24 hours. 2005 Winner of the Endurance Master. Winner of the Le Mans 24 hours. 2004 Winner of the Oschersleben 24 hours, Winner of the World Endurance Championship. 2nd of the Le Mans 24 hours. 2003 2nd of the Le Mans 24 hours. Winner of the Spa 24 hours. Winner of the Bol d’Or 24 hours. 2nd of the French Superproduction Championship. 2002 Winner of the Le Mans 24 hours. Winner of the Bol d’Or 24 hours. 2001 2nd of the Le Mans 24 hours. 2nd of the Bol d’Or 24 hours. Winner of the French 600 Supersport Championship. 2000 Winner of the Le Mans 24 hours. 1997 Winner of the French 250cc Championship. 1996 Winner of the French 250cc Championship. 2007 Participation in the Le Mans 24 hours test. De 2003 à 2005 Australian Superbike championship. 2001 et 2002 AMA Superbike championship. 2000 25th of the world Superbike championship with 1 win (Philip Island). 1999 AMA Superbike championship. Win in Laguna Seca during the world Superbike championship (Wild Card). 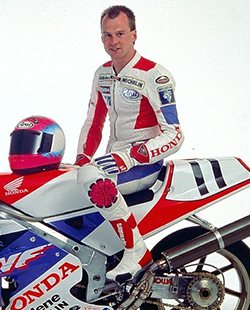 1996 8th of the world Superbike championship with 3 wins and 3 pole positions. 1995 4th of the world Superbike championship with 2 wins (Laguna Seca and Philip Island). 1994 First race in the world Superbike championship as Wild Card (Philip Island). Realize the pole position, win the first race and finish 3rd of the second race. 1994 – GMT94 6th of the Le Mans 24 hours. 5th of the Bol d’Or 24 hours. 1993 Participation in the Bol d’Or 24 hours. 1992 Participation in the Le Mans 24 hours. 1991 Podium in the French 250cc championship (Albi). 1990 2nd of the French Promosport 750cc championship. 5th of the Le Mans 24 hours. Participation in the FIM Endurance Cup. 1989 3rd of the French Promosport 750cc championship. 1988 2nd of the French Promosport 500cc championship with 2 wins (Montlhéry and Pau-Arnos). Born January 11th, 1962. Death July 30, 2003 (helicopter crash). 1999 Pole position at the Oschersleben 24 hours (GMT 94). 1998 3rd of the British Superbike Championship. 1995 Winning British Superbike Championship. 1994 Winning Senior Tourist Trophy. 1993 2nd of the British Superbike Championship. 1992 Winning Senior Tourist Trophy. 1991 Winning Senior Tourist Trophy. 1990 Winning British 250cc Championship. 1987 Winning Formula 2 Tourist Trophy. 1987-1994 Win 11 time the Tourist Trophy all categories combined. 2003 – GMT 94 3rd of the world Endurance championship. 6th of the Le Mans 24 hours. 2nd of the French Supersport championship. 2002 3rd of the Le Mans 24 hours. 2000 2nd of the French Superbike championship. 2nd of the Bol d’Or 24 hours. 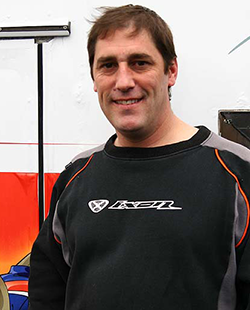 1999 Winner of the French Supersport 600 championship. 1998 3rd of the French Supersport 600 championship. 1997 5th of the French Supersport 600 championship. 1996 5th of the French Open 250cc championship. 1995 Winner of the French 250cc championship. 2003 6th of the Le Mans 24 hours. Winner of the 200 miles of Assen. 2001 Winner of the Oschersleben 24 hours. 3rd of the Bol d’Or 24 hours. 43rd of the World Superbike Championship. 2000 2nd of the Bol d’Or 24 hours. 44th of the World Superbike Championship. 1999 14th of the World Superbike Championship. 1998 Winner of the Le Mans 24 hours. 15th of the World Superbike Championship. 1997 15th of the World Superbike Championship. 1994 Winner of the Supersport and Superbike Spanish Domestic Series. 1993 Winner of the1st race in Calafat in 250cc GP Spanish Championships. 1991 Two races in Spanish domestic Championship- 75cc class. 1998 6th of the Le Mans 24 hours. Participation in the Spa 24 hours. 1997 4th of the Le Mans 24 hours. Participation in the Spa 24 hours. 7th of the Bol d’Or 24 hours. 1996 Participation in the Le Mans 24 hours. Participation in the Bol d’Or 24 hours. 1995 4th of the Bol d’Or 24 hours. Participation in the Le Mans 24 hours. 1992 5th of the Le Mans 24 hours. 1991 5th of the Bol d’Or 24 hours. 1988 4th of the Bol d’Or 24 hours. 1987 Winner of the French Promosport 750cc Championship. 1986 3rd of the Spa 24 hours. 1983 5th of the French Promosport Championship. 2001 6th of 250cc World Championship (2 podiums). First victory in 250cc World Championship (Assen). 2000 14th of 500cc World Championship (2 podiums). 1999 10th of 250cc World Championship 2nd poll position. 2nd podium (Assen). 1998 9th 250cc World Championship 1st poll position first podium (Germany). 2006 – GMT 94 3rd of the Le Mans 24 hours. 2005 World Superbike Championship (Foggy Petronas). 2004 Win in the World Superbike Championship (Philip Island). 6th of the World Superbike Championship. 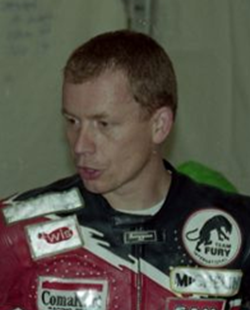 2002 Several qualifications in first line in the World 250cc Championship. 2001 3 podiums in the World GP 500cc Championship (Suzuka, Estoril and Sepang). 2000 5th of the World GP 500cc Championship. 3 wins in the World GP 500cc Championship (South-Africa, Spain and Portugal). 3 podiums in the World GP 500cc Championship (Sepang, Brno and Rio de Janeiro). 1998 First season in the Worls GP 500cc Championship. 1996 Second win in the World GP 125cc Championship (Australia). 1995 First win in the World GP 125cc Championship (Malaysia). 1994 First podium in the World GP 125cc Championship (Australia). 1993 First pole position in the World GP 125cc Championship (France). 1995 2nd of World endurance Championship 2nd of 125cc French Championship 8th of 125cc European Championship Participation in Le Mans 24H Participation in Bol d’Or 24H Participation in Spa 24H-Francorchamps. 2001 Participation in the Bol d’Or 24 hours. (GMT 94) 6th of the French Open Supersport Championship. 2000 Winner of the French 600 Supersport Championship. 3rd of the Spa 24 hours. 1999 2nd of the French 600 Supersport Championship. 3rd of the Spa 24 hours. 1998 Winner of the Yamaha Cup. 2nd of the 1000 miles Yamaha Cup. Winner of the Le mans 24 hours category 600 Supersport. 1997 Winner of the Yamaha Cup. 2nd of the Le Mans 24 hours category 600 Supersport. 7th of the Bol d’Or 24 hours category Stocksport. 1996 5th of the CB Cup. 2nd of the Bol d’Or 24 hours category 600 Supersport. 1995 4th of the French 50cc Championship (Group 3). 1994 Winner of the French 50cc Championship (Group 2). 1992 Winner of the French 50cc Championship (Group 1). De 1989 à 1991 Winner of the Mob 4 hours. 1996 Participation in the Bol d’Or 24 hours. (GMT 94) Official rider of Yamaha for the Le Mans 24 hours. 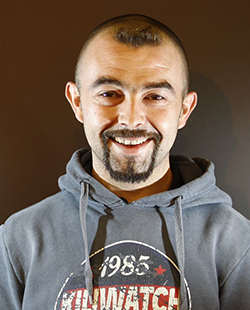 De 1994 à 1995 Official rider in Endurance and in the French Superbike Championship. 1993 3rd of the French Superbike Championship. De 1990 à 1992 Winning French Superbike Championship. 1987 Official rider in Endurance Championship. 1986 Winning 750 Promosport Championship. 1983 2nd of the 750 Promosport Championship. 1982 5th of the 1100 Promosport Championship. Start in competition. 1990 Winner of challenge Open 125. Born March 12th, 1957. Put an end of his life the August 15th, 2005. 1999 – GMT 94 Participation in the Oschersleben 24 hours as advisor. 1996 4th of the 16 hours of Assen. 1995 Winner of the Le Mans 24 hours. 1994 Winning French Supersport Championship. 1993 Winning French Supersport Championship. 1991 Winner of the Le Mans 24 hours. 1989 3rd of the European 500cc Championship. 2003 16th in GP 250 World Championship Twice 7th in GP 250 World Championship (Philip Island et Assen). 2002 – GMT 94 Participation in the 200 miles of Imola. 2002 Pole position in the Bol d’Or 24 hours in the Stocksport category (1.42.8). Win in French Endurance Cup (Lédenon). Participation in the Le Mans 24 hours. 2001 4th of the French Promosport 600c Cup. 2000 Podium in French Promosport 1000cc Cup (Lédenon). 1999 Winner of the 500 CB Cup. Winner of th French Endurance Cup. 1997 French 500 CB Cup Championship. 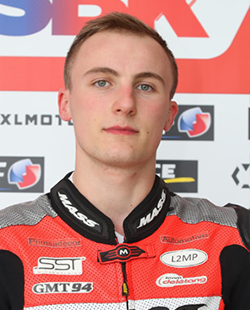 Born on June 23, 1989 in Le Mans (France) 2015 Moto2 GP 2014 Moto2 GP 2013 Moto2 GP 2012 Moto3 France Grand Prix Winner 2009 Le Mans race winner in the 125 cc French Championship 2007 125cc French Championship runner-up Winner of the “Challenge de l’Avenir FFM” Third in Donington (English Championship Final) Donington Dorna Cup runner-up 2005 Beginning in Honda Junior Cup 125 French Championship. 2003 – GMT 94 6th of the Le Mans 24 hours. 6th in Imola (Italia). 4th in Albacete (Spain). 2nd in Brno (Czech Republic). 3rd in Zeltweg (Austria). Winner of the Oschersleben 24 hours (Germany). 2nd in Vallelunga (Italia). 3rd of the World Endurance Championship. 2002 4th of the Le Mans 24 hours. Pole position in the Silverstone 200 miles. Winner of the Brno 6 hours. 3rd in Lédenon during the French Superproduction Championship. Pole position in the Oschersleben 24 hours. 3rd of the Bol d’Or 24 hours. 3rd of the World Endurance Championship. 2001 Winner of the Le Mans 24 hours. Pole position in the Brno 6 hours. Winner of the Nürbürgring 6 hours. 2nd of the Liège 24 hours. Pole position in the Oschersleben 24 hours. 2nd of the World Cup. 2000 4th of the Le Mans 24 hours. 2nd in Estoril. Winner of the Oschersleben 24 hours. Winner in the 600 Supersport Championship in Carole and lap record (1’03’’2). 2nd of the World Endurance Championship. 1999 4th of the Le Mans 24 hours. Pole position in the Oschersleben 24 hours. Participation in the Spa 24 hours. Podium in Estoril. 3rd of the Bol d’Or 24 hours. 1998 2nd of the French Supersport Championship. 6th of the Le Mans 24 hours. Participation in the Bol d’Or 24 hours. Participation in the Spa 24 hours. 1997 7th of the Bol d’Or 24 hours. 4th of the Le Mans 24 hours. Participation in the Spa 24 hours. French Supersport Championship. 1996 Participation in the Bol d’Or 24 hours. Participation in the Le Mans 24 hours. 1995 Participation in the Bol d’Or 24 hours. 1994 et 1995 Member of the Team of France in 250cc. 1997 – GMT 94 4th of the Le Mans 24 hours. Participation in the 24 hours of Spa. 1996 5th of the Le Mans 24 hours. 1995 2nd of the world endurance championship. 1992 3rd of the 6 Hours of Johor. 1990 Winner of the Belgium Supersport championship. 1988 Winner of the Belgium « Silhouette » championship. 1987 Winner of the Belgium Open championship. 1986 Winner of the Belgium 250cc championship. Winner of the Belgium Superbike championship. 1983 Winner of the Belgium 250cc championship. 1981 Winner of the Belgium 250cc championship. 1979 World 250cc championship. First race in the world 250cc championship (Belgium). 2006 Participation in the Bol d’Or 24 hours Test. 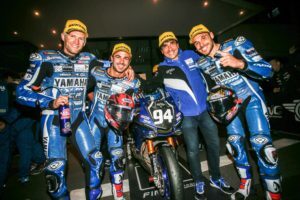 (GMT 94) 14th of the World Supersport Championship with 2th in St-Marin. 2004 Participation in the World GP 125cc Championship (2 races). 2002 7th of the World GP 125cc Championship with 2th in Portugal. 2001 7th of the World GP 125cc Championship. First best lap in race (Rio de Janeiro). 2000 6th of the World GP 125cc Championship. 2 wins in Catalogne and Rio de Janeiro. 1999 8th od the World GP 125cc Championship. First podium in the World GP 125cc CHampionship (Imola). 1995 Italian Sport Production Championship. Start in competition. 2002 Participation in the Oschersleben 24 hours. Participation in the world Superbike championship (14th in South-Africa and 15th in Misano). 2001 Participation in the world Superbike championship (11th in Misano). Participation in the Le Mans 24 hours. Participation in the Bol d’Or 24 hours. 2000 French Open Supersport championship. Participation in the world Superbike championship (last 4 races). 1999 French Open Supersport championship. Participation in the Le Mans 24 hours. Participation in the Bol d’Or 24 hours. Participation in the Spa 24 hours. 1998 French Open Supersport championship. Participation in the Le Mans 24 hours. 1997 French Open 250cc championship. Participation in the Bol d’Or 24 hours. 1995 5th of the French 125cc championship. European 125cc championship (5th in Le Mans and Carole; 6th in Brno). 1994 3rd of the French 125cc championship. Participation in the GP 125cc (3 races). 1990 French Open 125cc championship. Start in competition. 2001 9th of the Bol d’Or 24 hours. 2000 2nd of the Le Mans 24 hours. Winner of the Estoril 8 hours. Participation in the Bol d’Or 24 hours. 1999 2nd of the Le Mans 24 hours. 2nd of the French Supersport championship. 1998 2nd of the Bol d’Or 24 hours. 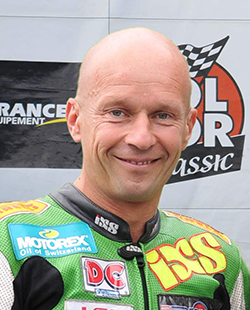 1997 Winner of the French Superbike championship. Podium in the Bol d’Or 24 hours. 1995 Winner of the French 600 Promosport championship. 1993 2nd of the French 400 Promosport championship. 2006 Participation in the Bol d’Or with GMT 94. 10th of the German Superbike IDM Championship (3 podiums in 3 races). Participation in the Holland Supersport Championship (2 podiums in 2 races). 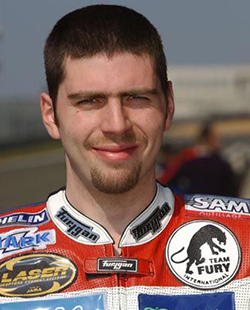 2005 Winner of the World FIM Stocksport Cup (2 wins in Germany and France). 2004 4th of the World FIM Stocksport Cup. 2002 9th of the Superstock Championship. 5th of the Oschersleben 24 hours. 5th of the Vallelunga 200 miles. 2001 23rd of the EK Superstock. 2000 29th of the EK Superstock. 1999 Winner of the Belgium 250cc Championship. Winner of the Belgium 600 Endurance Championship. 1998 First race in the Belgium 250cc Championship (Zolder). Start in competition. 1992 Participation in the Carole 1000km. Winner of the French Superbike championship. 2nd of the Bol d’Or 24 hours. 1991 Winner of the FIM Endurance Cup. 2nd of the French Superbike Championship. Winner of the Malaysia 8 hours. Winner of the Bol d’Or 24 hours. 2nd of the Australia 8 hours. 3rd of the Le Mans 24 hours. 1990 Winner of the FIM Endurance Cup. Winner of the Le Mans 24 hours. Winner of the Bol d’Or 24 hours. 3rd of the Suzuka 8 hours. 1989 Winner of the FIM Endurance Cup. Winner of the French Superbike championship. Winner of the Le Mans 24 hours. Winner of the Liège 24 hours. Winner of the Suzuka 8 hours. Winner of the Bol d’Or 24 hours. Winner in the world Superbike championship (Austria). 1988 Winner of the Le Mans 24 hours. Winner of the Bol d’Or 24 hours. 2nd of the Liège 24 hours. 2nd of the French Superbike championship. 1987 Winner of the French Superbike championship. 3rd of the Le Mans 24 hours. 1986 2nd of the world endurance championship. Winner of the Le Mans 24 hours. Winner of the Liège 24 hours. Winner of the Hockenheim 1000km. Winner of the Jerez 1000km. 1985 2nd of the Liège 24 hours. Winner of the Bol d’Or 24 hours.